Several times my daughter, Julie, had telephoned to say, "Mom, you must come see the daffodils before they are over." I wanted to go, but it was a two-hour drive from my place by the beach to her lakeside mountain home. "I will come next Tuesday," I promised, a little reluctantly, on her third call. The next Tuesday dawned cold and rainy. Still, I had promised, and so I got in the car and began the long, tedious drive. When I finally walked into Julie's house and hugged and greeted my grandchildren, I said, "Forget the daffodils, Julie! The road is invisible in the clouds and fog, and there is nothing in the world except you and the children that I want to see bad enough to drive another inch!" My daughter smiled calmly, "We drive in this all the time, Mom." "Well, you won't get me back on the road until it clears and then I'm heading straight for home!" I said, rather emphatically. "Gee, Mom, I was hoping you'd take me over to the garage to pick up my car," Julie said with a forlorn look in her eyes. Smiling she answered, "Just a few blocks, I'll drive ... I'm used to this." After several minutes on the cold, foggy road, I had to ask "Where are we going? This isn't the way to the garage!" "We're going to the garage the long way," Julie smiled, "by way of the daffodils." "Julie," I said sternly, "please turn around." "It's all right, Mom, I promise, you will never forgive yourself if you miss this experience." We got out of the car and each took a child's hand, and I followed Julie down the path. As we turned a corner of the path, and I looked up and gasped. Before me lay the most glorious sight. It looked as though someone had taken a great vat of gold and poured it down over the mountain peak and slopes. The flowers were planted in majestic, swirling patterns, great ribbons and swaths of deep orange, white, lemon yellow, salmon pink, saffron, and butter yellow. Each different-colored variety was planted as a group so that it swirled and flowed like its own river with its own unique hue. 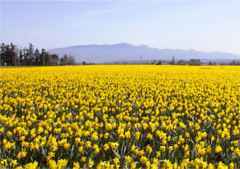 There it was ... "The Daffodil Principle" For me that moment was a life-changing experience. I thought of this woman whom I had never met, who, more than thirty-five years before, had begun - one bulb at a time - to bring her vision of beauty and joy to an obscure mountain top. Still, this unknown, old woman had forever changed the world in which she lived. She had created something of magnificent beauty, and inspiration. "It makes me sad in a way," I admitted to Julie, "What might I have accomplished if I had thought of a wonderful goal thirty-five years ago and had worked away at it 'one bulb at a time' through all those years. Just think what I might have been able to achieve!" My daughter summed up the message of the day in her direct way, "Start tomorrow, Mom," she said, "It's so pointless to think of the lost hours of our yesterdays. The way to make learning a lesson a celebration instead of a cause for regret is to only ask ... "
"How can I put this to use today?" The Daffodil Principle says that it's never too late to pursue your dreams, one step at a time!